The American Silver Eagle bears the distinction of being one of the world’s most popular silver bullion coins. The series premiered in 1986, and an annual Silver Eagle has been released in each year that followed with a total of 130 million coins sold to date. Each coin is equivalent to one troy ounce of 0.999 fine silver plus a small amount of copper for hardness and to add to the durability of the coin while helping the coin to be mar- and scratch-resistant. The United States government guarantees the purity, content, and weight of the Silver Eagle, and it is minted to exact specification by the United States Mint. The Silver Eagle is considered by many to be one of the most attractive coins that have been minted to date. 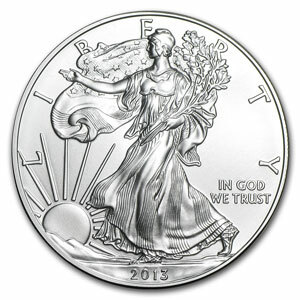 The design of the coin is based on the “Walking Liberty” by A.A. Weinman. This design was originally used on the silver half dollar in 1917. The design features a scene that depicts freedom, with an eagle and shield which denote the pride and strength of America. The American Silver Eagle coin is America’s only official silver bullion coin of investment grade quality. As such, this coin is welcomed by major investment markets around the world. This coin can be included in an Individual Retirement Account (IRA). Some financial planners advise that adding silver to one’s portfolio can improve the performance of the portfolio, since the forces determining the price of silver typically differ from the determining forces in other types of financial assets. Simply put, silver investments can make your portfolio less volatile. It is convenient, affordable, and easy to own Silver Eagles. Because Siler Eagles can be converted into cash with ease and are redeemable through a network of precious metals and coins dealers, they are a liquid investment. The face-value of the coin is largely a symbolic denotation. The price of silver is substantially greater, and has a long history of holding its own over time. You can purchase Silver Eagle coins in a variety of settings, from precious metals and coin dealers to participating brokerage houses and banks. These locations sell the coins at the market price for silver, based on rates published in financial publications, plus a premium that covers the seller’s distribution costs. The U.S. Mint has been minting silver coins since 1792. When you invest in Silver eagles, you are choosing a coin that features the symbol of U.S. freedom and independence – the American Bald Eagle. American Silver Eagles are produced at the US Mint’s facilities using blank silver rounds provided by the Sunshine Minting Company. After production, individual coins are packaged in sealed tubes of 20, which are placed into green plastic Monster Boxes, containing 25 tubes for a total of 500 coins. Investors can purchase Silver Eagles by the tube of Monster Box, typically affording a nice discount relative to spot price. The collectible proof version of the coin is also quite popular. This coin can be purchased directly from the U.S. Mint. The proof version of the coin also weighs one troy ounce and has a face value of one dollar. There are also gold and platinum proofs for certain issue years.